Cookies and cream is a classic combination that both my husband and I love especially in ice cream. When Suzanne brought this dessert for our dinner party, we were so excited to try it out! Suzanne came across a similar recipe but when she made it, it wasn't as good as she hoped. So after much tweaking and quite a few substitutions, she came up with her own recipe that was outstanding! The creamy, chocolate and whipped cream layers of this dessert is delicious in contrast to the crunchy, chocolate crust the layers sit on. I suppose one could even take this recipe a bit further and use other pudding flavors in place of the devils food chocolate pudding such as butterscotch, banana or even vanilla. I would recommend making this dessert in a glass baking dish so that you can showcase the pretty layers. Regardless of what you end up using to make these, you'll have an empty dish soon enough! In a food processor, combine the chocolate graham crackers and oreo cookies. Pulse to crumbs for bottom crust. Measure out 4 cups of this chocolate cookie crumb mixture and place in a bowl. Reserve any remaining for future use. To the 4 cups of chocolate cookie crumbs, add the melted butter and stir. Press this mixture into the bottom of an ungreased 9x13 pan. Bake in the preheated oven for 10-12 minutes or until set. Remove from oven and allow to cool completely. While the crust is cooling, combine the softened cream cheese, 1 cup of whipped topping and powdered sugar in a bowl. Spread this mixture over the cooled crust; set aside. In another bowl, combine the dry pudding mixes, milk, and 3/4 cup of whipped topping. Spread this mixture over the cream cheese layer. Top the pudding layer with remaining whipped topping. Refrigerate for at least 2 hours or overnight. Sprinkle with chocolate jimmies if using and cut into squares and serve. My grandmother always used to make something similar that was equally delicious. Oh this looks really nice. Just one question, in the 2nd last step when you mix the dry pudding mixes with the milk and whipped topping, are we suppose to cook the pudding or just layer it uncooked? @Anonymous - Note: you should use INSTANT pudding as reflected in the ingredient list so it does not need to be cooked. 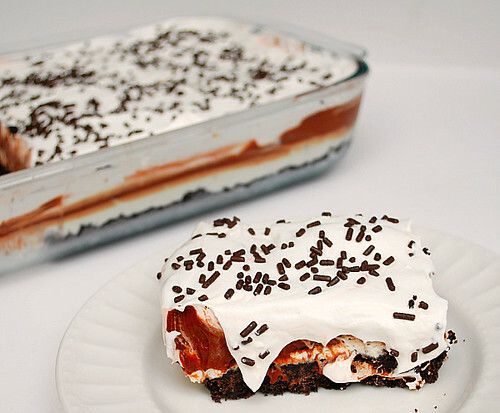 Only the dry mixes + milk + whipped topping makes up the chocolate pudding layer. My MIL makes this, we now both love it! I make it with the pecans and flour crust as well!